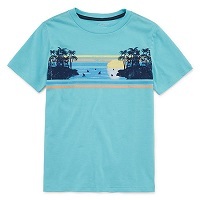 At JCPenney we know that kids love expressing themselves, so we have a vast assortment of graphic tees to delight them and everyone who sees them. These cool shirts make great gifts, so pick up at least one for each of kids on your shopping list. We all know that a picture is worth a thousand words, right? Since you can't write a book on the front of your child's tee – at least not one that everyone can read – let the picture do the talking. JCPenney has comic, gaming, and even Disney themed shirts that will delight your kids. Some are a single, large graphic, while others have an allover print. Does your little one love dinosaurs? We have shirts with dinosaurs. How about butterflies? We've got you covered. 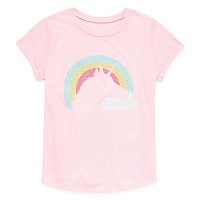 Look around, and you're sure to find the perfect image that suits your child to a "T."
Whether your child wants to send out an encouraging message or make others laugh, JCPenney has the perfect T-shirts for kids that will do that. Let folks know that your kid is "Endless Awesome," "Chillin' Like a Boss," or "Up to No Good" by having the shirt make the statement. We even have fun unicorn T-shirts – some with sayings and others with nothing but an image. JCPenney offers tons of options when it comes to finding a T-shirt style that works for your little ones. You'll be happy to see long sleeves, short sleeves, and all lengths in between. We also have V-neck, crewneck, raglan style, and tunic length tees. Do you want something a little different? Check out one of the tees with a pocket on the chest, a ruffle at the hem, or a tie on the cuff. Most of us love celebrating special occasions and holidays, which is why JCPenney offers a selection of festive T-shirts to add to the spirit. Take a look at the "Birthday Boy" and "Birthday Girl" shirts if your child is about to celebrate another year. As the holiday season approaches, your child will enjoy wearing a "Santa's Little Helper," "Be Merry," or even a "Define Naughty" shirt. 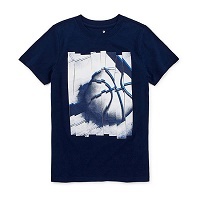 We offer quite a few shirts that appeal to kids with hobbies and special interests. Does your child love gaming? Check out some of the Minecraft shirts. Some children enjoy wearing T-shirts with superheroes such as Captain America, Marvel's Avengers, and Paw Patrol. Once your children put on one of these shirts, you might have a hard time getting them to take it off. The answer to this problem is to get more than one. You'll love the quality of these graphic tees, and your child will enjoy the comfort. All of our kids' shirts and tees are made to last through many wearings and washings without fading or looking worn. The soft fabric feels great next to the skin, so you can rest assured that your child will be comfy all day. The bonus is that all of these tees are priced so reasonably that you can pick up as many as you want without putting a huge dent in your bank account. JCPenney wants to be your favorite place to shop for kids' clothes, so we make them to last at a price you can afford.